It’s probably never been a better time to be a new CPG brand. Thanks to new distribution channels like Facebook, Twitter, Instagram and YouTube, it’s never been easier — or cheaper — for a new brand to build and audience and find customers online. One of the ways that Brandless has been able to lower costs is by reducing the number of products it offers. With a product development team in Minneapolis led by Rachael Vegas, the company has narrowed its product line down to a couple hundred essential items. Vegas previously worked at Target for 15 years, where she most recently oversaw the company’s center-of-store grocery business. While Target had tens of thousands of SKUs represented in its grocery markets, Brandless has tried to source just the essentials from its partners. It may not offer a dozen different versions of the same product, but its selection also doesn’t seem incomplete. 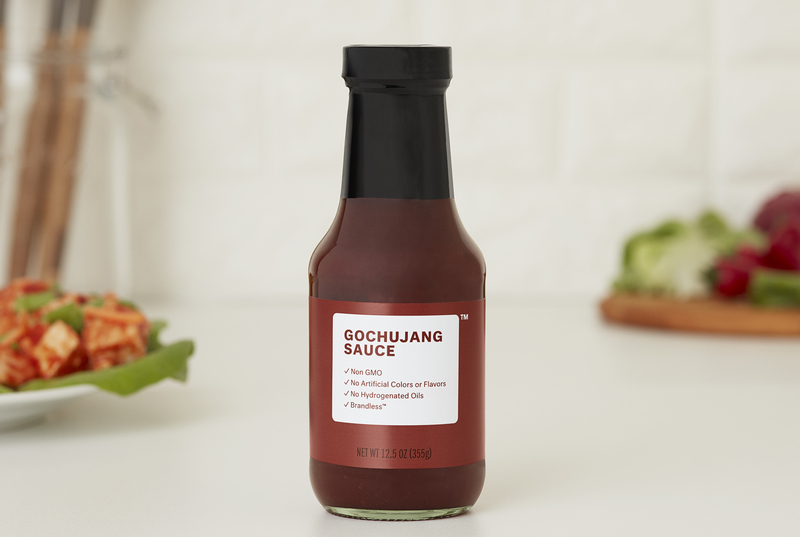 The company is also betting on a few trend-forward items, like say quinoa puffs or gojuchang sauce, and has plans for seasonal items that it expects to sell during the holidays. Another key difference is Brandless packaging, which seeks to highlight the important details of each product. That means pointing out what’s non-GMO, organic, fair trade, or kosher, as well as which things are gluten-free or have no added sugar. But the biggest difference between Brandless and all the major CPG players is its business model: Rather than sell through traditional retail stores, the company is offering its goods online. In the process cutting all the distributor costs, breakage costs, sales trade costs and other fees associated with retail distribution, which is the main way it’s able to offer products so cheaply. It’s also creating a direct relationship with the consumer, which most CPG brands don’t actually have. With billion-dollar exits for companies like Dollar Shave Club and Jet.com, investors are lining up to back new e-commerce brands going after huge markets. That’s certainly the case for Brandless, which has raised more than $50 million over three rounds of funding prior to launch. Brandless was incubated by Sherpa Capital, where Sharkey was a venture partner before returning to life as a founder, and it received seed funding from Cowboy Ventures and Slow Ventures. Redpoint led the company’s Series A round, and NEA and GV just closed a $35 million Series B in the company ahead of its public unveiling. Those investors are betting on a couple of serial entrepreneurs in Sharkey and Leffler who have deep experience in community, e-commerce and consumer goods. Prior to Sherpa, Sharkey served as CEO of Johnson and Johnson subsidiary BabyCenter and had also co-founded the online media company iVillage. Leffler, meanwhile, has founded a number of consumer brands, including Cheeky, YesTo and Yoobi. Few startups have dared to go after the traditional grocery business, but with plenty of funding, a couple of seasoned entrepreneurs at the helm, a diverse set of products and a disruptive pricing model, Brandless is ready to take on that challenge.